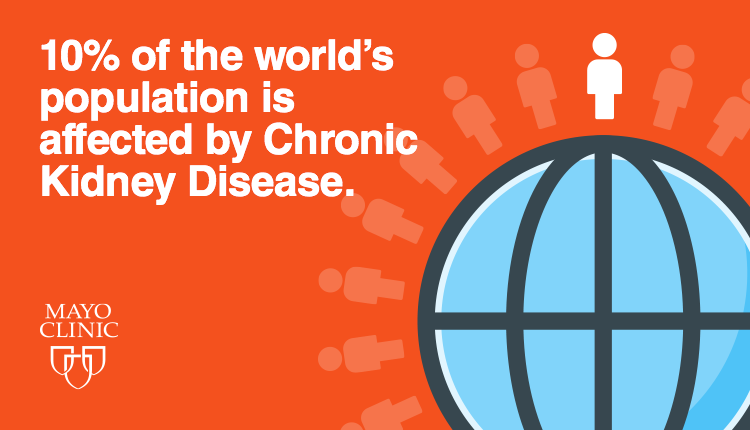 Chronic Kidney Disease (CKD) affects 1 in 10 people worldwide. World Kidney Day focuses on educating the public, medical community and governments to encourage prevention and early detection. People affected by obesity have an 83 percent increased risk of CKD, making maintaining a healthy lifestyle even more important. Not sure where to seek help? Mayo Clinic Healthy Living Program helps members find the right meal and exercise plan that’s best for them. March 9th is World Kindey Day. Chronic Kidney Disease (CKD) affects 1 in 10 people worldwide. People affected by obesity have an 83 percent increased risk of CKD.